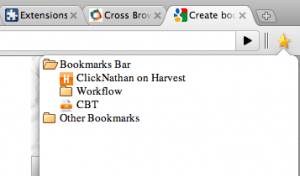 For anyone who likes the idea of a bookmark’s toolbar and isn’t satisfied with the idea of it only appearing in the New Tab window of Google Chrome, but also doesn’t necessarily want a huge bar spanning the width of the browser (like in most other browsers, where your bookmarks are all listed below the address bar), there’s a great little dropdown solution via an extension called Bookmark Tree. It’s not the prettiest solution, I’ll admit, but it gets the job done well and only the dropdown itself is a little ugly, given the choice of font. But everyone needs a little Times New Roman in their life and let’s face it, it’s just lacking on the hit websites these days.